DEAR MOM WHO NEEDS TO BE REMINDED THAT SHE MATTERS - THIS IS - ProudMummy.com the Web's Community for Mums. 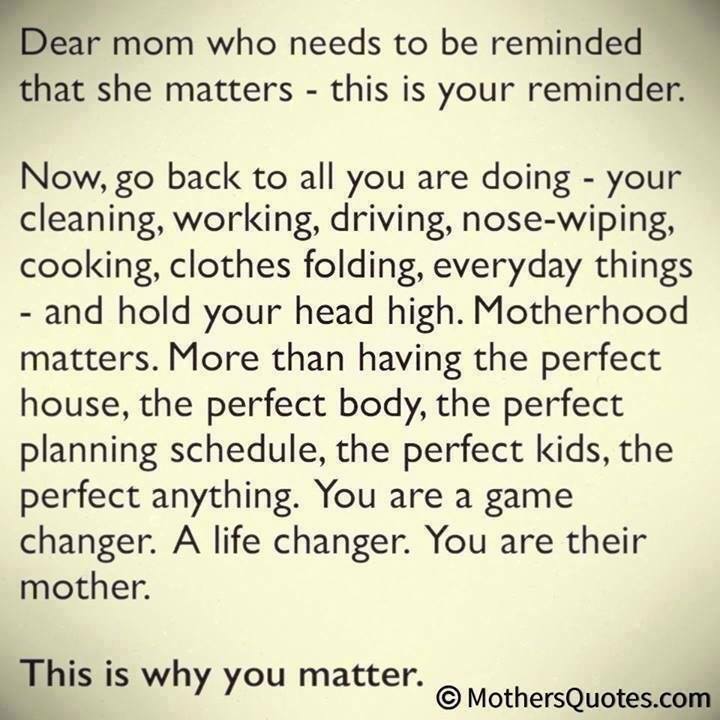 DEAR MOM WHO NEEDS TO BE REMINDED THAT SHE MATTERS - THIS IS YOUR REMINDER. NOW, GO BACK TO ALL YOU ARE DOING - YOUR CLEANING, WORKING, DRIVING, NOSE-WIPING, COOKING, CLOTHES FOLDING, EVERYDAY THINGS - AND HOLD YOUR HEAD HIGH. MOTHERHOOD MATTERS. MORE THAN HAVING THE PERFECT HOUSE, THE PERFECT BODY, THE PERFECT PLANNING SCHEDULE, THE PERFECT KIDS, THE PERFECT ANYTHING. YOU ARE A GAME CHANGER. A LIFE CHANGER. YOU ARE THEIR MOTHER. THIS IS WHY YOU MATTER. Scott Raby remember all I do!